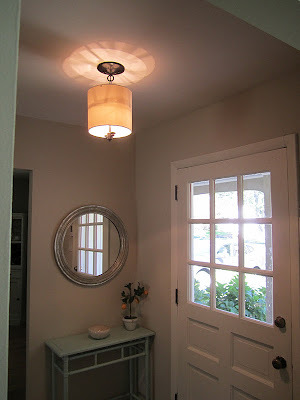 Swoon Style and Home: Entryway Light: Transformed! For Free! 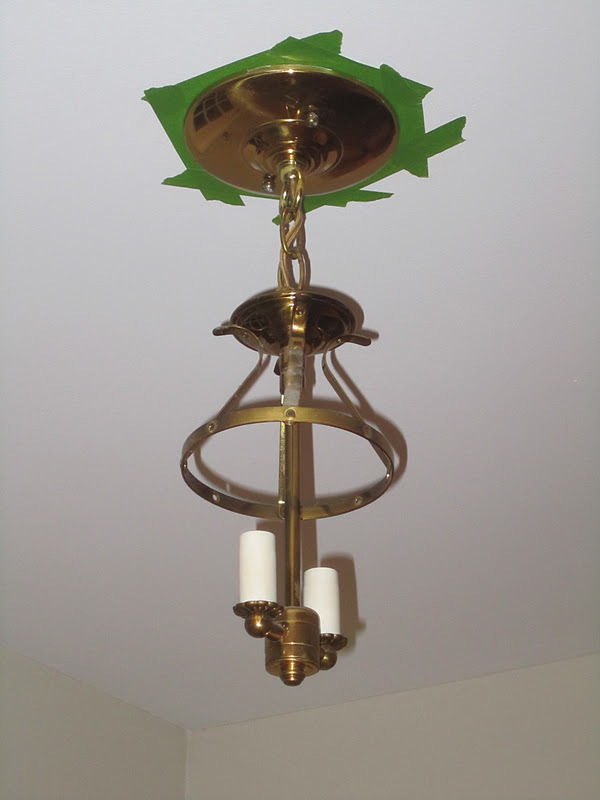 As you can see, it is dated brass and way under scale for that space. But its replacement cannot be too big because the bottom of the light comes super duper close to the top of the doorway! 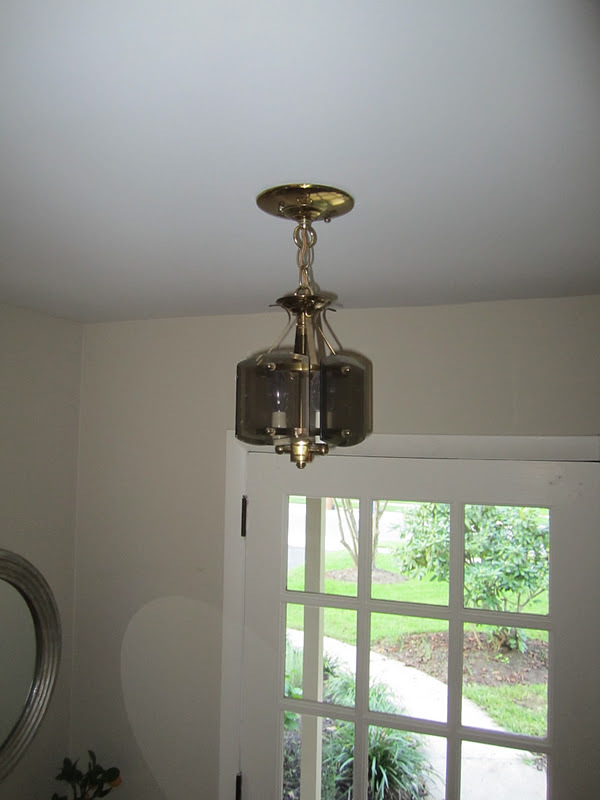 Initially, I was thinking I'd just save up for a flush mount fixture and swap it out, but part of me really wanted to try to work with what I've got. I looked closer and realized the glass panes were easily removable. So I thought ... hmm ... what if I take off the panes, use some black paint to change the finish from brass to black and then find an inexpensive drum shade to cover it. It could work right? 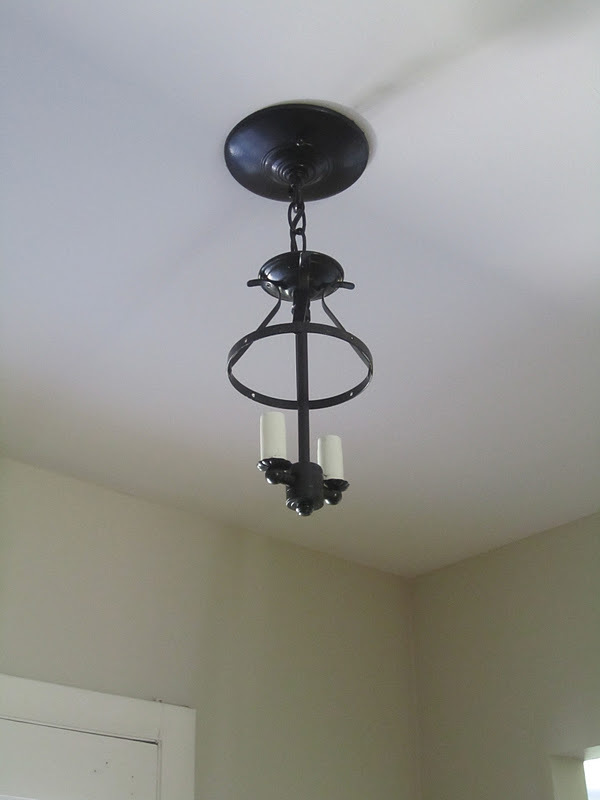 I'm no stranger to painting chandeliers -- in fact, I've done it several times in my old house. Finding the right size shade for a price I was willing to pay was not easy. In fact, it was almost impossible. 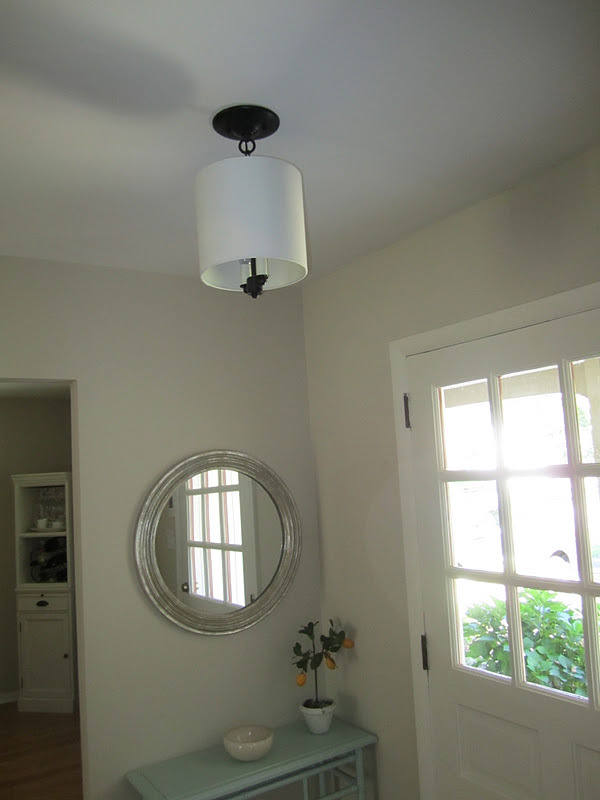 I needed a shade that was no taller than 8 inches and I needed the drum to be a true drum and not tapered. 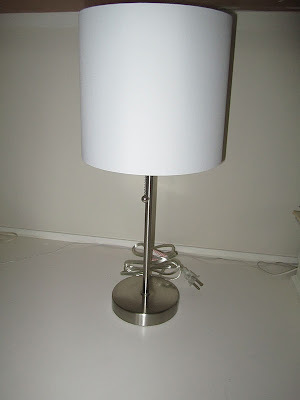 Most drum shades that I found were either 9 inches or if they were the size I needed they were either tapered (boo) or $50+. I did not want to spend that much on a shade because at that point, I'd just spend another $30 and get a new fixture. I was just about ready to give up when I noticed I already had a drum shade on an inexpensive lamp from Target. 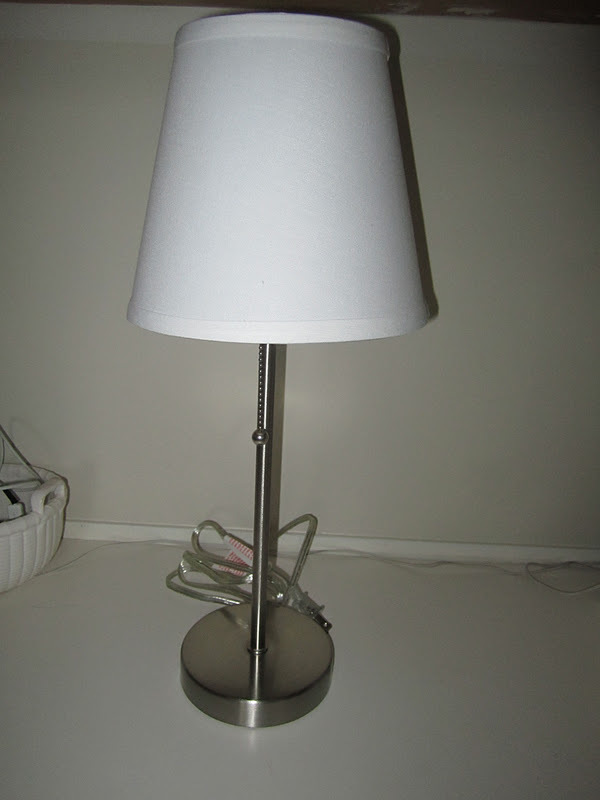 I bought the lamp for our kitchen desk area and it's just been sitting there. I measured and OMG the shade was less than 8 inches! 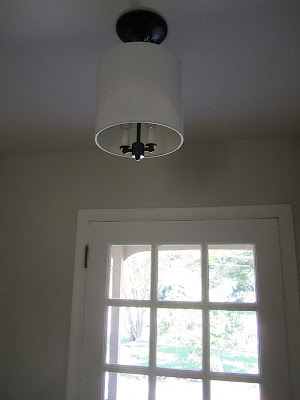 I just bought a cute inexpensive clip on shade at Lowe's to replace it. See? So with my supplies in hand, I got to work. First, I removed the glass panes around the fixture and swiped on about four coats of black paint with a foam brush. This took no time at all. I'll note that I did not remove the light from the ceiling. I just taped under the top part and was careful. See the progression from brass to black? Yey. Next up, the shade. 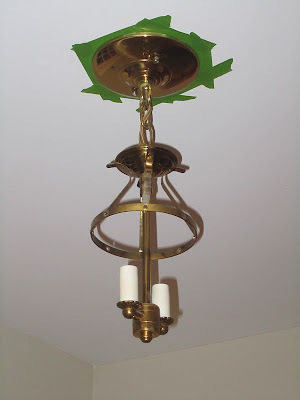 I removed the center circle on the lampshade and figured I would just use those metal support brackets to affix it to the light fixture. The only problem? Oh those little metal supports broke right off! Oh no. But I didn't give up. Instead, I ran up to my craft closet and grabbed some wooden dowels. I thought I could use them as supports instead. 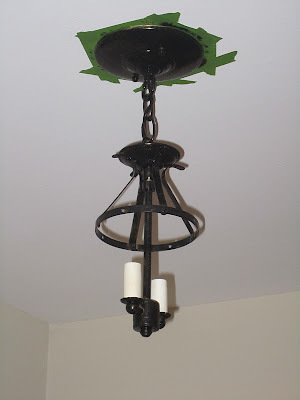 I cut them to fit right under the lip of the lampshade and then did a quick spray of white spray paint. Then I got up on a ladder and moved my shade under the light fixture and brought it to the top. 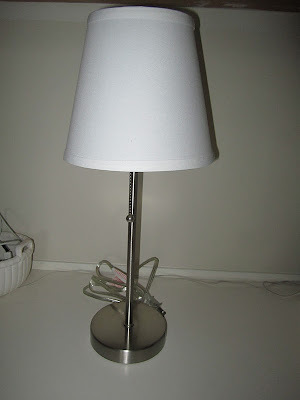 I wedged the dowels under the lip of the lamp shade so they were nice and snug. 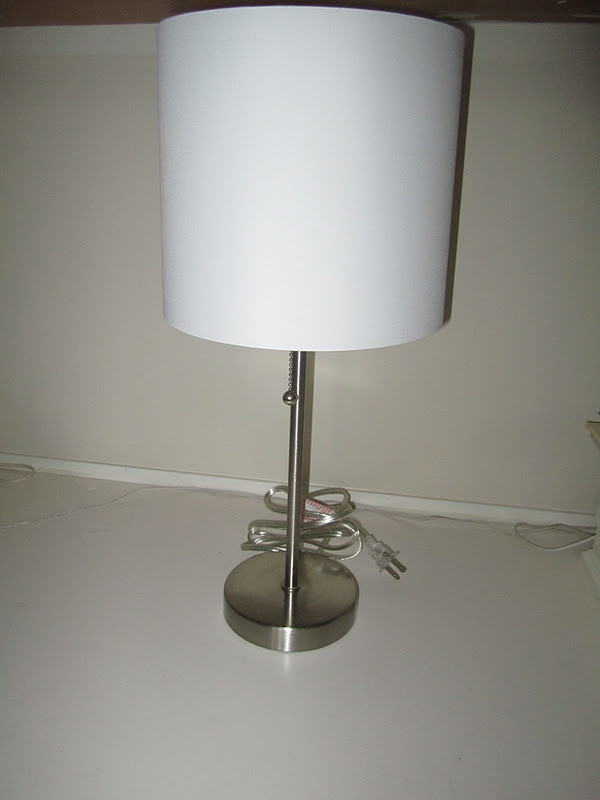 Then I rested the dowels on top of the center support of the light. To make sure they wouldn't move, I got out the ol' glue gun and glued the dowels in place. The dowels are not visible at all, unless you're really looking for them and then only if you're directly under the light and look up and stare. And ... ta da! The light looks amazing, in my humble opinion. And I absolutely LOVE that it was free! F-R-E-E! Here it is from lots of angles. 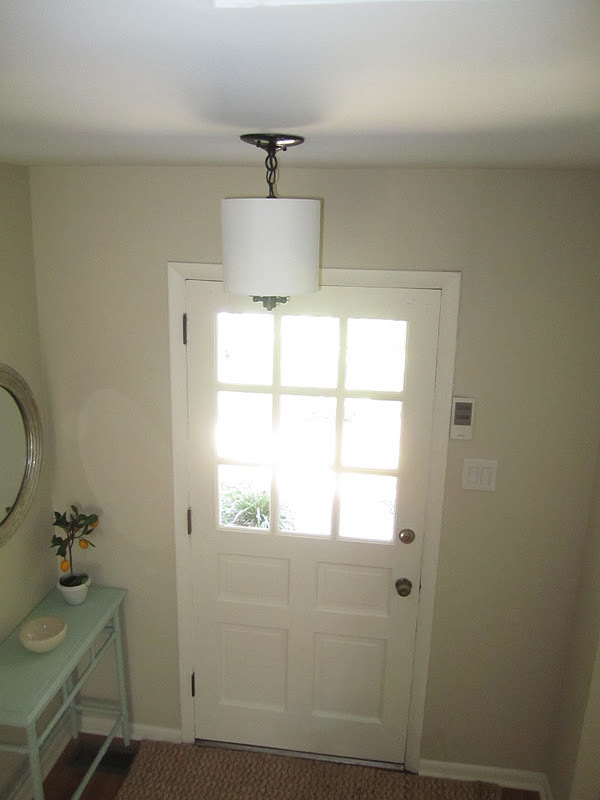 The plan for the entryway is to add lots of white board and batten around the space and paint a light grey above, so I think the black will help ground the space more than a white or silver would. Here's one last before and after because I know how much fun those are. Shanna you never cease to amaze me!!! You are always creating beauty in your home!! 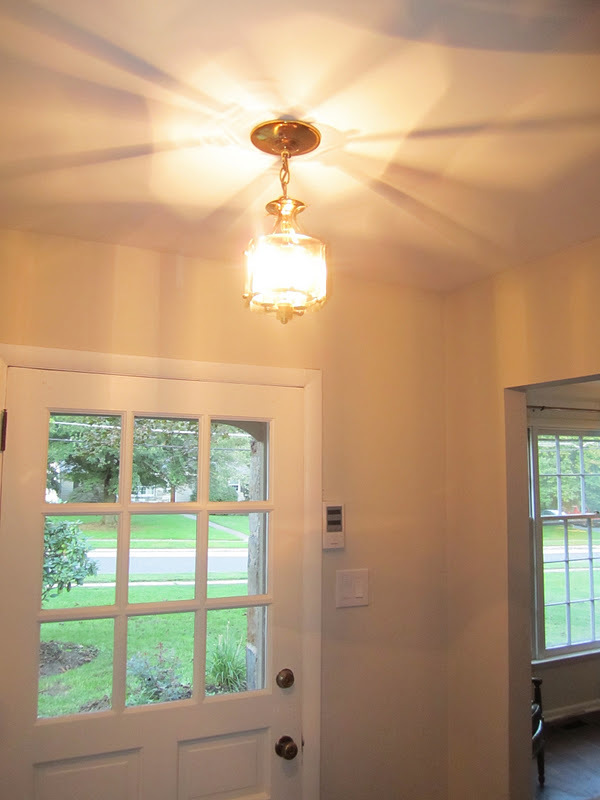 Love that "new" light fixture, and so smart of you to paint it while it was hanging!!!!! Looks awesome Shanna! And how lucky about that Target shade working out. Finding the perfect shade is totally the hardest part so I'm glad you figured it out so inexpensively. Rock on!